Thank you for sharing this rare LP. It is really exciting to listen to this old Radiobroadcast and furthermore it gives a great picture of what Huxley wanted to say with the book. A joy. He's been a hero of mine for a long time but I've never seen footage of him before. Such phenomenal clarity of mind. Many, many thanks. Hi!I'm from Argentina I really enjoy reading this book! I am a teacher teaching Brave New World, and will use this in class. thank you for sharing. Since this is out of print, any chance of putting side 2 on the site? wow this is amazing - thank you so much for sharing!!! Thanks for the freebie. I love this kind of media. You're doing a good service. Thank so much you for this! Fab stuff. Always been a big fan of Huxley, and this gives a really personal touch to his work! On an FYI note, a bunch of the comments for this article are linkspam for .info domains, which you might want to look at deleting. See the comments from "dorota", "isabelle", "prazedes" and "louise". 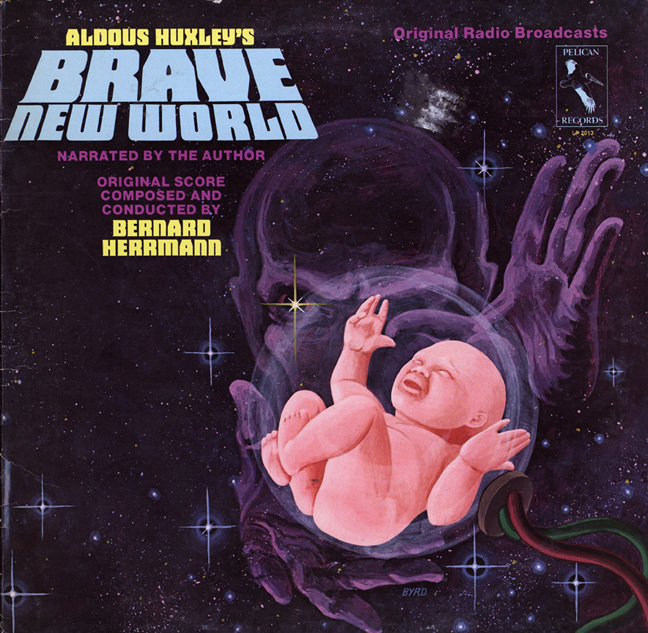 I admire Huxley's work and didn't know this existed (with music by Bernard Herrman !). I'm very eager to listen to it. Thank you. Hi! very good lp. But unfortunately I can't enter the link to side 2.It appears as non existent.Is it possible to find it at another site? Are you doing anything tonight/this weekend/tomorrow?f you are not busy tonight, would you like to go out with me? thank you very much for sharing this for all to enjoy, and for the benifit of others, thanks again from New Zealand. What a treat! This is such an important book! Huxley was greatly admired by Ernst Jünger, who agreed with the veracity of his dystopic perspective far more than with that of Orwell's.